Earth: Earth is the source and provider of our needs. Represents sensations, decay, patience, stability, strength, health, warmth and comfort, trees and plants, animals, including humans, and animal instincts. Air (Wind): Air representes mental activity, thoughts, reason and intellect, memory, knowledge, persuasion, birth and friendship, freedom, clarification and expression. 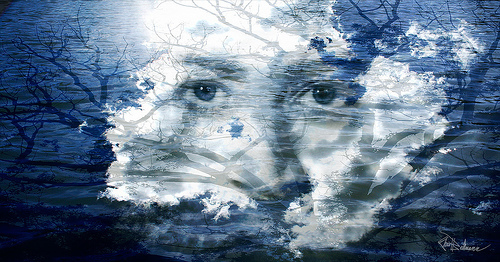 It is often symbolized by winds, clouds and sky. Water: Water imbibes all life forms. We flow with the "tide" of our feelings. Water involves intuition, insight, conception and pregnancy, fertitlity, the womb, health, beauty and divination. 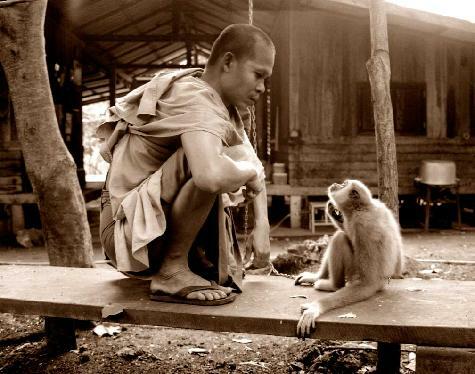 "The Monk & The Monkey" was photographed at the famed Temple of the Tigers near Kanchanaburi, Thailand in 2002. The temple monks rescue endangered animals including Tigers and the monkey shown in the photo from the black market trade near the Burmese border. 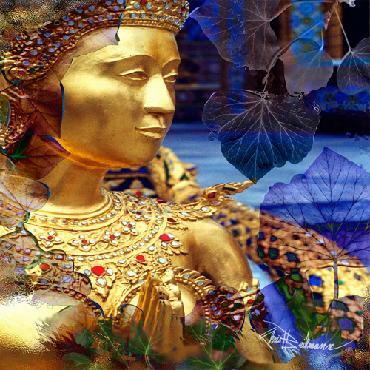 The "Garden Kinaree" was inspired by and created from photos taken from in Thailand in 2002. This is one of the artists earliest photo collage pieces created. "Kinarees are depicted as half-bird half-women creatures in Thai, Cambodian and Lao, and Burmese mythology. One of the many creatures that inhabit the mythical Himapan Forest, Kinaree has the head, torso, and arms of a woman and the wings, tail and feet of a swan. She is renowned for her dance, song and poetry, and is a traditional symbol of feminine beauty, grace and accomplishment." "Requiem for a tree" represents the strong tie between man and tree and the respect that was once given to trees but is seldom seen today. Primitive man observed the growth and death of trees, the annual decay and revival of their foliage. Through these observations, they made the connection between the animal and vegetable world and regarded the tree as sacred. In almost every part of the world, travellers have observed the custom of hanging objects upon trees. Wreaths, ribbons or rags are often suspended from the branches to win favor for sick loved ones or cattle, as prayers or merely for good luck. The tree is has also been used as an oracle through the ages. 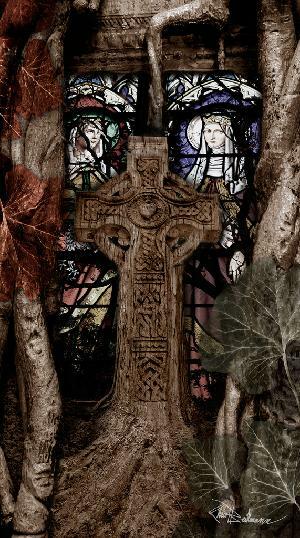 Best known, perhaps, is the oak of Dodona tended by priests who slept on the ground. Forms of the tall oaks of the old Prussians were inhabited by gods who gave responses. Important sacred trees are also the object of pilgrimage, one of the most noteworthy being the branch of the Bo tree at Sri Lanka. The tree-spirits will hold sway over the surrounding forest or district, and the animals in the locality are often sacred and must not be hunted or harmed in any way. 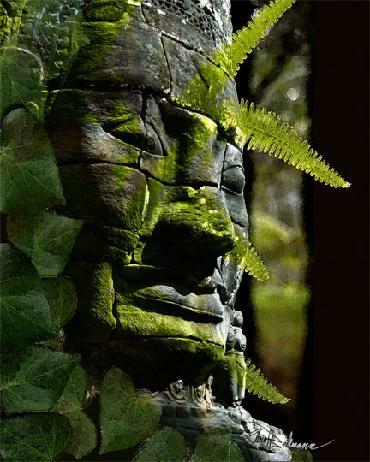 The Forest King was created from the artist's original photography of the Angkor Thom in Cambodia. The main photo used in the artwork was taken at the Bayon located within Angkor Thom. The Bayon features many towers surrounded by the serene smiling face of Jayavarman VII carved in a traditional Buddhist style. Angkor Thom was the last and most enduring capital city of the Khmer empire. It was established in the late twelfth century by king Jayavarman VII. It covers an area of 9 km_. Angkor Thom remained the capital of a kingdom in decline until it was abandoned some time prior to 1609, when an early western visitor wrote of an uninhabited city, "as fantastic as the Atlantis of Plato". The ruins of Angkor were shrouded in thick jungle growth, vines and trees. Some temples have been restored over the last century, but many still remain a mystical ruin of the forest. Angkorian ruins are unique as they contain both Hindu and Buddhist temples and artistic styles.